This month of October is popping! So far, so good!! A lot of artists including Rihanna, Frank Ocean, Alicia Keys and even Gwen Stefani have hit up their local studios to either put the finish touchings to their upcoming albums or singles that they're about to put out. Or even starting a new album! Frank Ocean has been one of the main people that have hit up the studio a lot this month. Check out some studio session pics from different artists/producers below. MAGIC: Frank Ocean, Pharrell Williams & Jay-Z all took time out of their busy schedules to hit up the studio and even take a picture. With these three in the studio, magic is bound to happen. Can't wait! 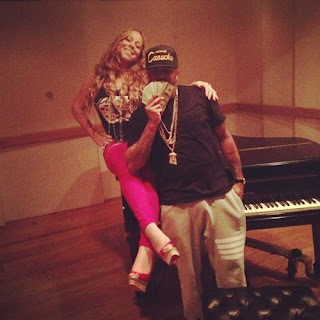 BEST OF FRIENDS: Despite all the mess and drama happening on the set of American Idol auditions, Mariah Carey stopped by the studio to work with long-time friend and producer The Dream. UNAPOLOGETIC: Rihanna hits up the studio in LA adding the finishing touches to her album "Unapologetic" - out 19th November. It was even rumoured that Rihanna even sent raunchy pics to Chris Brown during one of the sessions. (*sigh). But above it all, Rihanna's swag is crazy!!! No Doubt just released their brand new album "Push & Shove" and Gwen Stefani is already back in the studio. The singer was spotted in LA heading to a studio in Burbank. "Wonder what would happen if u put Luda & M.I.A. In the studio. Hhhmmmmm." is what M.I.A. captioned when she put up this pic of herself and rapper Ludacris in the studio via her instagram. Well, M.I.A. we'll find out when you and Ludacris put something out for us to hear!! BEST IN THE BUSINESS: As I said above, Frank Ocean is one of the many people that have hit up the studio a lot this month. And most recently, he met up with producer NO I.D. and rapper J.Cole for a studio session. Frank Ocean just seems to be the go-to-go for hot songs this season, and I must say - his songs and songwriting skills are surely incredible. So I see why not!